204 Annapolis House, Oceanside Sea Colony beach retreat. No roads to cross to get to the beach. Walk to Bethany's boardwalk and town center. Most affordable oceanside two bedroom at Sea Colony. $5,000 decorating credit with an acceptable offer during the month of March — Now $279,000. 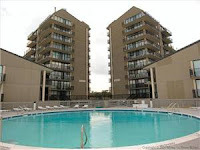 Bethany Beach, Delaware: Sea Colony Beach Community — On the Atlantic surf's edge, just south of Bethany Beach, Delaware, and just north of Ocean City, Maryland, Sea Colony is "The Premier Family Beach & Tennis Resort Community." Sea Colony features a half mile of private beach (guarded in the summer), indoor and outdoor pools (kiddie pools, too), world-class tennis (named among the "50 Best Tennis Resorts in the U.S." by Tennis Magazine and #19 in the world by Tennis Resorts Online), fitness centers (the largest features an indoor pool, indoor gym, saunas, weight room, exercise equipment, saunas, whirlpool, outdoor pool and more), activities for all ages (including sandcastle contests, swim meets and more), in-season community shuttle and year-round security.